scrappin it: TOP 10 CONTEST! In about two weeks we will celebrate the Jewish New Year! by helping me sum up what has been an amazing year. 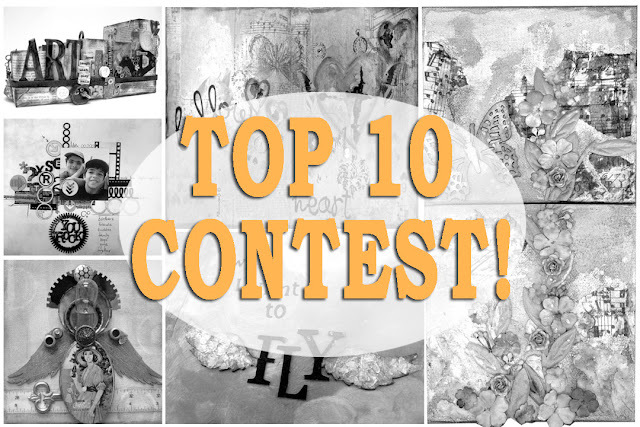 This celebration is equally amazing because you get to tell me what are your favorite Einat Kessler projects and win a FABULOUS GOODIE BAG! and leave me a comment telling me what are your three favorite projects. 2. Spread the word about this contest on your social media or blog. (leave me a separate comment telling me where you shared it or leave the link). Each of these will grant you an extra entry in the random raffle. Can't wait to see what you picked!! I love your work. You are a wonderful inspiration!!! As always ALL your projects are inspiring and amazing. November 22 2014 - How to create peeled paint effect? thank you for so generously sharing your talent with us and inspiring us to "try"!